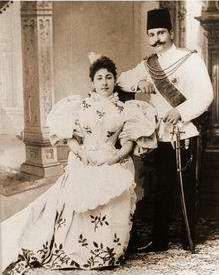 Princess Shivakiar (1876-1947) was the first wife of King Fuad I of Egypt, a marriage that only lasted for a few years in the late 1890s. She went on to marry four subsequent husbands, and her ex-husband also remarried. 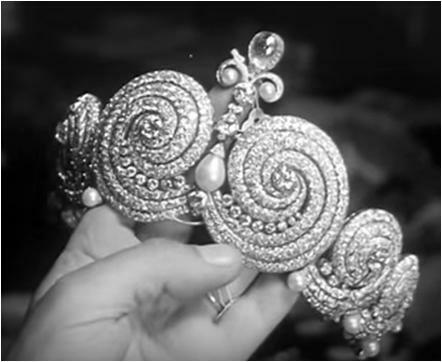 Still, it Shivakiar's name that is tied to this platinum, diamond, and pearl tiara, which is said to have been commissioned from a Parisian jeweler by King Fuad. The tiara stayed with the Egyptian royal family, and when the monarchy was abolished in 1953, it was among the jewels held by the government. The above video displaying this tiara and other crown jewels was taken in 1954, when - not unlike the French and Russian governments after getting rid of their respective monarchies - it was said that the Egyptian authorities were prepping the gems for an auction that may never have occurred, at least not in full. Some pieces worn by the Egyptian royals essentially disappeared, and some have turned up in sales years later, but others remained with the government. This is one of those jewels. The Egyptian government displays the pearl and diamond tiara at the Royal Jewelry Museum in Alexandria with over 900 other pieces of jewelry. The museum reopened in 2014, having been closed since the 2011 revolution. Of these similar scrolling Cartier designs, which would you pick?